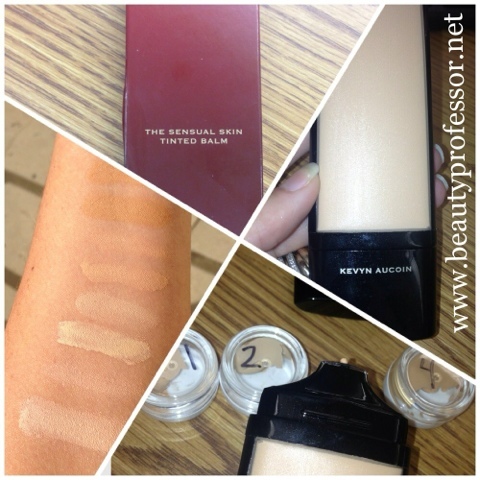 Beauty Professor: Sneak Peek at Kevyn Aucoin Sensual Skin Balm!! Ever since I heard murmurings that the Kevyn Aucoin line was coming out with a lighter version of its famed Sensual Skin Enhancer (all shades swatched HERE), the foundation addict in me has been on the hunt for this elusive Sensual Skin Tinted Balm. In light of the fact that the Kevyn Aucoin line hasn't released a new foundation formula in years and this product is STILL not available on online, I have been diligently tracking its release. When my gallant brother was in NYC last week, he stopped by Barneys and picked up #3 for me as well as samples of the other three shades (there are four shades total in this formula). Although my formal review (as well as a myriad of swatches) of the product is a work in progress (it's been a busy work week! ), I thought I would share this little collage...more to come on this amazing new formula in the very near future! Above (clockwise from top): The packaging for the Kevyn Aucoin Sensual Skin Tinted Balm, my balm in #3, representatives of all four shades and swatches of all four shades in direct sunlight (swatches heavy and blended). Oooooh...I'm very intrigued! Can't wait to see the full review! Thanks for stopping by! The full review will be up soon!! I am glad to know that I am not the only one that has been stalking this product ; ) The product is $48.00 and shade #4 (labeled swatches in various lighting to come soon!) seems to be the best match for deeper skin tones. Do please check back soon!!! Omg excited. May need to go to Barney's today! Yes, it is crazy how some flesh colored liquid can make one jump for joy! Can't wait to hear your thoughts once you check it out! Oooh! Exciting news! :) Very intereested in this. It is exciting indeed, Sharina! I will be posting the full review ASAP!!! Yay, I love the original, but it can look too heavy and accentuate my dry patches. I can't wait to get my hands on this one. How do you like #3, is it a good match to original's SX06? Thanks. I agree...the original formula can look too thick and pronounced if I am not careful! I can attest to the fact that this formula is much sheerer, but buildable and long lasting...so pleased with this release! #3 is definitely a good match for anyone in the #6-#8 range in the original SSE...the whole line runs quite light (which surprised me in light the vast offerings for darker skin in the SSE formula).